I was a huge detractor of Matt Smith as The Doctor when I heard he was cast. I didn’t see a single promotional photo or image from his past work that made me think The Doctor. It’s not that I was that big a fan of David Tennant, but I just didn’t have any faith. However, after that very first episode of Season Five, I was in love. It took no time for me to fall for Amy and Rory as well, and as far as I’m concerned, the Moffat/Smith Era of Doctor Who has been the best of the revival. So take what I’m about to say with that in mind. I love the flights of fancy and the quick shifts into horror or tear-jerking drama whether it’s from episode to episode or within the same adventure. The only episodes this season that I didn’t care for were “The Curse of the Black Spot” and “Closing Time,” but that’s mainly because I just didn’t buy into the twists at the ends and they were a little sloppy in their production. However, Space Pirates is a great idea. It’s the ideas like that, and the amazing gathering of fantastic alien characters in “A Good Man Goes to War,” that make me love this era. 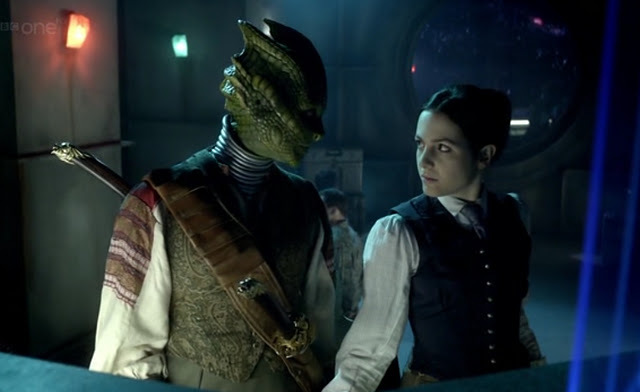 Hell, the creation of Madame Vastra and Jenny are great enough that I’m willing to overlook any minor shortcomings with the rest of the adventure. Are you listening BBC? We need more Madame Vastra and Jenny. Sure, there were new aliens introduced almost weekly in the previous years, but not only were they kind of bland, they didn’t have any real narrative flair. Except for Captain Jack, of course, but he was created by Moffat. Season Six begins with the mystery of Who Killed the Doctor, builds to the revelation of the True Identity of River Song, and along the way addresses, and course-corrects, the concept of The Doctor as Superhero. We also get a number of moments that address themes of parenthood, fatherhood in particular, and they never ring too terribly false (although “Closing Time” came close). My favorite element of the season, though, was the recurring use of doppelgangers and alternate versions of characters due to crossing timelines. That’s a lot of extremely inventive television and I didn’t even mention the episode written by Neil Gaiman, “The Doctor’s Wife,” which is one of the high points of the show’s Forty-Nine year history. Moffat kept a lot of plates spinning as the season went along, and the finale, “The Wedding of River Song” brought a lot of storylines together, along with a ton of guest-stars from episodes over the past two years. Not all of the questions are answered and a few new ones are raised, which should make the run up to the Fiftieth Anniversary very interesting. The DVD set is a nice package of six discs that not only have every episode plus the 2010 Christmas special “A Christmas Carol,” but a number of extras that really make this an attractive package. There are abbreviated versions of fifteen Doctor Who Confidentials (most of which are abbreviated, which is disappointing, but they hit the highlights at least), four “Monster Files” installments, trailers for the first and last half of the season, five commentary tracks (including Neil Gaiman’s discussion of his episode), and a few short prequels that set ominous tones for the episodes to follow. The best part of the set, in my opinion, is the inclusion of the BBC Comic Relief shorts “Space” and “Time” which, while comedic in nature are perfect fits for the series and may very well be canonical at this point. In addition to these treats, there are five “Night and the Doctor” shorts filmed specially for this release. I think I enjoyed these as much, if not more, than most of the episodes this season. And I loved this season, if I hadn’t made that clear above. 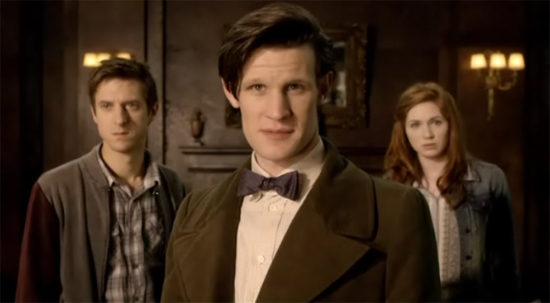 The first two focus on The Doctor and Amy as she tries to share her concerns about her own sanity. But it’s not as heavy as that makes it sound. In fact, they embody that sense of whimsy and adventure I mentioned at the beginning of this review. The second two focus on The Doctor and River and perfectly captures the energy and flirtatiousness of their relationship. You can just skip the last mini-episode. All in all, this is a very nice package with a healthy number of enjoyable and satisfying extras. If you’re a fan of Matt Smith and Steven Moffat then this is a must-buy. The only real shortcoming is that there aren’t audio commentaries on every episode. But those mini-eps more than make up of it in my book.